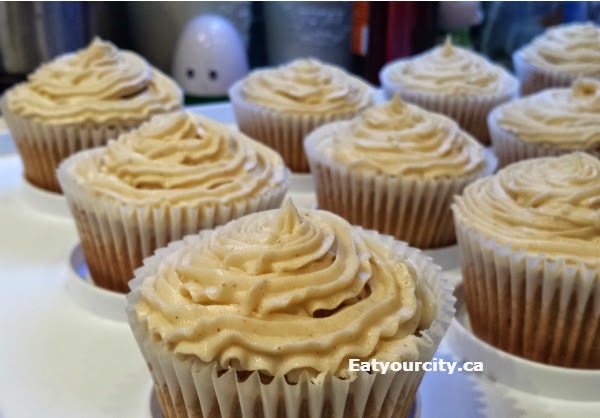 Eat Your City: Masala Chai latte cupcakes with Chai buttercream recipe - with Remedy Cafe's chai syrup! 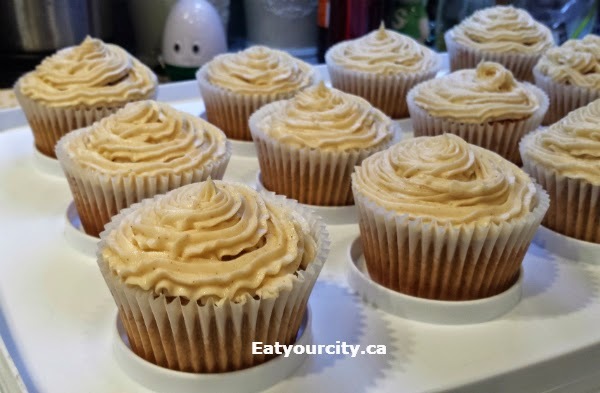 Masala Chai latte cupcakes with Chai buttercream recipe - with Remedy Cafe's chai syrup! Posted by I love chai lattes. Okay, we chould be saying masala tea, which means spiced tea, cuz chai literally means "tea"... the gentle warming flavors of cinnamon, ginger, cardamon, cloves and pepper infused into full bodied strong black tea and mellowed out with the creaminess of milk. So, for a momma-to-be's who happened to love love love Chai lattes, I decided to make some Masala Chai latte cupcakes topped with a chai buttercream for the baby shower. I modified a recipe from the talented Jennifer Rao, owner and principal cake designer of Around the World in 80 Cakes to incorporate SC's favorite chai flavors from Remedy Cafe, a local legend in Edmonton - they mix up probably the best chai in the city, and plenty of other restaurants serve their chai by buying their ready made chai concentrate... off to make some delicious Masala Chai latte cupcakes with Chai buttercream! While the smoothed out ones had nice smooth rounded tops. By the way, my house smelled like heaven while these babies baked! 1) Preheat oven to 350F. In the original recipe, you steep the tea in the hot milk and let it cool. Since I used concentrated chai syrup, I skipped that step. Cream together butter, sugar and vanilla on high in a mixer, scraping down the sides often until its nice and fluffy. 2) While the mixer is creaming butter-sugar mixture, in a large bowl, combine all the dry ingredients. In a measuring cup or small bowl, combine the milk and chai syrup if using. 3) Add in eggs, one by one to the creamed mixture, beating well after each addition. 4) Alternating between the chai-milk mixture and the dry ingredients mixture, add to the mixer, beating well between each addition. The mixture looked dense so I cranked my mixer to high for 5 minutes to beat in some air bubbles to make the cupcakes fluffier. 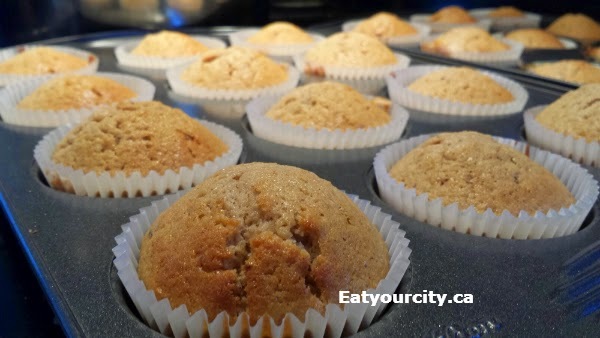 5) Line your cupcake/muffin tins with paper liners, and fill them about halfway full - should make a full 24 cupcakes. Bake for 20-25 minutes until a wooden toothpick comes out clean when you poke it in the center of a cupcake. Cool on cooling rack completely before icing. -4-6 cups sifted confectioners sugar (approximately 1 lb) - I usually use 4-5 cups in super unhumidified Canada.. only add sugar until its the consistency you want. 1) In large bowl, cream butter with paddle attachment on electric mixer. Add in vanilla, cinnamon and 2 tablespoons concentrated chai syrup (or strongly brewed tea + ginger and cardamon). Gradually add sugar, one cup at a time, beating well on medium speed. Stop the mixer and scrape sides and bottom of bowl often so everythign gets incorporated. 2) Beat at medium speed until light and fluffy. You can add in an additional 2 tablespoons chai syrup or strongly brewed tea (4 max) to thin out the icing to the consistency you prefer. I like beating it for at least a minute on high after each addition of sugar... and am known to walk off and let it beat on high for about 5 minutes to let it get really light and fluffy at the very end.. you can't overbeat buttercream.. it only gets fluffier and lighter.